It’s no secret that Ubisoft’s upcoming open-world action-adventure title Watch_Dogs will have a multiplayer component, but new information revealed by PS Blog uncovers details – scant though they may be – on how that might operate when the game hits later this year. PS Blog writes that Watch_Dogs‘ single and multiplayer elements will “seamlessly” overlap, and…well, that’s about it, really, as PS Blog notes that “details are still under lock and key.” That interconnectedness will “extend to a companion companion experience on mobile devices,” though no further information was given on that either – though the concept is fitting, considering the concept behind the game. The blog has some other tidbits about Watch_Dogs, though none are as interesting as the multiplayer bit – the game, set in Chicago, hopes to present its virtual world as a “living, breathing city” as opposed to a “collection of giant painted boxes.” Almost anything in the game can be hacked, allowing protagonist Alden Pierce – himself a “man with a dark past who has made questionable choices” – the ability to gather information and, in some cases, do some old-fashioned spying (perhaps even by “peering into the living room of a Chicago citizen”), including by manipulating free wi-fi hotspots. Although much of the game is based around quietly gathering intel and sneaking about, full-on combat is a viable option to solve some problems. Developed by Ubisoft Montreal and releasing in November for Xbox 360, Wii U, PlayStation 3 and, once it launches, the PlayStation 4 (and likely the next Xbox as well, although that’s currently unconfirmed), Watch_Dogs is an open world action-adventure game that focuses on players’ ability to hack into electronic devices in order to complete various objectives, with a story centered on information warfare and the world’s increasing reliance on technology. 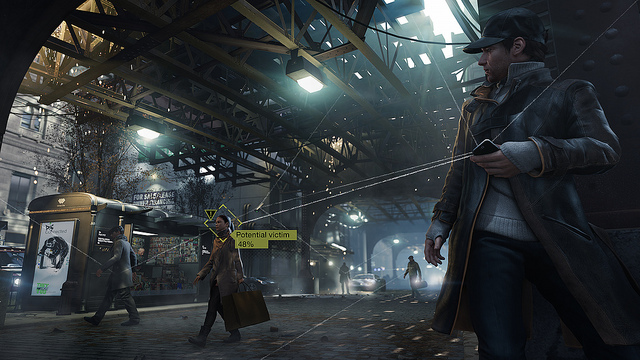 Are you interested to see how Watch_Dogs will integrate multiplayer and single-player? Let us know in the comments.